Marine Selective Catalytic Reduction Systems Market size in 2017 was valued over USD 3 billion and the annual installation is set to surpass 3,000 units by 2024. 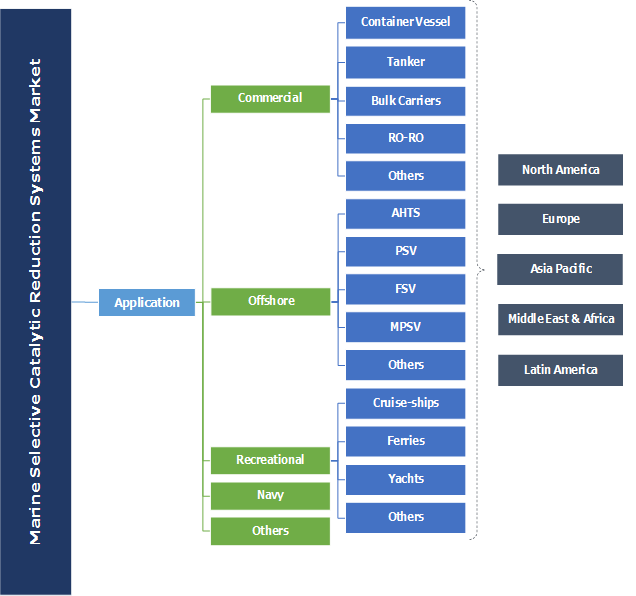 Global marine selective catalytic reduction systems market will grow owing to increasing concerns toward maritime pollution along with stringency in mandates to control the emissions. The IMO introduced a directive under Annex VI to limit NOx emissions by diesel engines with power output of over 130kW. The directives are applicable to all vessels built and installed on and after 1st January 2016. Stringent norms in the ECA zones along with introduction of monetary penalties by Port State Authority (PSA) in the case of non-compliance will complement the business outlook. Rising environmental concerns along with strict legislative norms with an aim to protect human and aquatic life will foster the marine selective catalytic reduction systems market growth. High emission levels from heavy fuel coupled with approval of low cost oil with SCR systems to comply with NOx norms is set to augment the business landscape. In addition, growing international merchandise trade along with increasing demand for container vessels and bulk carriers will boost the product demand. Healthy orderbook, positive outlook toward shipbuilding industry and restructuring of the older vessels with the stipulation of green agenda are few of the underline parameters encouraging the product penetration. Increasing R&D investments accompanied by the recent improvements in the product features will pervasively strengthen the marine selective catalytic reduction systems market share. 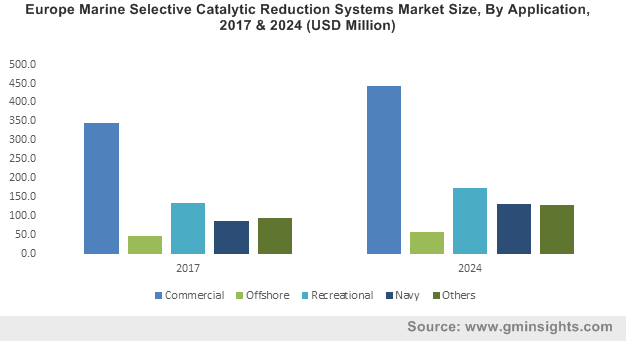 Recreational marine selective catalytic reduction systems market will grow owing to increasing demand for tourism driven by rising disposable income and growing demand for comfort & luxury. Ongoing R&D activities owing to the rapid technological advancements including ability to combat current cost pressure will encourage the product adoption. Commercial marine selective catalytic reduction systems market is anticipated to grow over 2% by 2024. Growing cross-border trade and long international voyage coupled with increasing standards pertaining equipment inspection, operation and construction will complement the product deployment. Moreover, rising environmental concerns and growing demand for sustainable systems is set to augment the business growth. China marine selective catalytic reduction systems market is anticipated to grow over 3% by 2024. Increasing NOx emissions from marine industry and its effect on human & environment health along with stringent legislations to curtail the pollution will encourage the product demand. Increase in foreign direct trade investments on account of cross-border mergers, acquisitions & tax inversions will propel the product penetration. The Chinese Ministry of Transport on 3rd July 2018, published new requirements with an aim to limit NOx emissions by second-hand imported and Chinese-flagged diesel engine vessels. These engines are required to comply with IMO Tier II norms and are applicable to vessels either imported or converted for domestic trade on and after 1st September 2018. The U.S. marine selective catalytic reduction systems market will onlook growth on account of high clean fuel cost including LNG along with ongoing technological advancements to manufacture sustainable units. Implementation of stringent government protocols in the ECAs coupled with retrofitting activities will further strengthen the industry outlook. Rise in shipbuilding pertaining to the battle forces and increase in demand for commercial vessels will further complement the business growth. Major industry players for the marine selective catalytic reduction systems market include Wärtsilä, Tenneco, YARA International, Mitsubishi, Hyundai, Johnson Matthey, Hitachi Zosen, PANASIA, Kwang sung, Agriemach, MAN Energy Solutions, Hug Engineering, Haldor Topsoe, DCL International, Caterpillar, H+H Engineering & Service, Danish Technology, CORMETECH, Niigata, ECOUREA, Ecospray, DEC Marine, and ME Production. Industry manufacturers are focusing toward product innovation, development, collaboration and R&D to comply with the internationally accepted norms and mandates. The companies are actively taking part in M&As with global and regional vendors to generate opportunities for marine selective catalytic reduction systems market growth. SCR systems are nitrogen abatement technologies deployed across engines and boilers to curtail the nitrogen emissions. Growing demand for green technologies along with government initiatives toward the development of these systems by the vessel manufacturers will positively impact the business growth.